Formula 1: Drive to Survive is a 10-episode Netflix series, a behind-the-scenes documentary that at its launch earlier this year promised to give "exclusive and intimate access to the greatest racing championship in the world". Designed for both die-hard fans and newcomers to the sport, it's a fly-on-the-wall experience spotlighting the drama and politics in F1. But just how far behind the scenes did it actually go? A problem with the series from the outset is that the sport's two top teams, Ferrari and Mercedes, declined to be involved. That's clearly disappointing, since the rivalry between them is one of the biggest focus points in the sport. Mercedes team principal Toto Wolff said the team's involvement in the documentary would have been a distraction, "especially also if our main competitor was not doing it". Could Ferrari and Mercedes not just have sat down and agreed to get involved and each be equally distracted? Luckily, there's enough sub-plots brought to life to keep it interesting in the absence of Ferrari and Mercedes. Throughout the series, Gunther Steiner is highlighted for his harsh yet amusing method of managing the Haas team. It's a peculiar management style - think David Brent in The Office. In episode seven, Haas driver Romain Grosjean is having a rough time. Steiner has had enough and takes his frustrations out at a Haas team dinner. Standing to address the team, Steiner says: "Maybe Romain didn't want to come because he had no points. Or maybe I didn't invite him because he doesn't deserve any food." Their relationship worsens through the season to the point where, after another crash, Grosjean sits against the wall and sobs. Seconds later we see Steiner simmering on the pit wall. "All this bad luck is draining me," says Grosjean. "In Formula 1 you do feel lonely sometimes. There are not many people who can understand what you're going through, you can be a hero to zero in five seconds." But Steiner is not interested: "Just stop whinging. Good guys never win…"
The series dramatises the biggest crashes, such as Nico Hulkenberg's flip after catching the wheel of Grosjean (who else?) in Abu Dhabi. After being sent airborne into the barriers, the German is left upside down "hanging like a cow". Seconds later his Renault catches fire. The shock of the moment is cleverly drawn out - even if viewers already know the outcome - with super slow-mo effects, long pauses, and scene cuts between team members, spectators, friends and family as they await his response on the radio. It's a moment that underlines the ever-present jeopardy to the sport, highlighting the repercussions that just one small one mistake has on the driver and the team. Everyone has a story, and there are hundreds of them in Formula 1. Daniel Ricciardo's is covered in episode one, beginning in Perth, Australia where the Red Bull man, alongside his parents, talks about where it all started for him, before he took off to Europe to chase his dream. "How could we not let him go?" says his mother Grace, who goes to the majority of the grands prix and always prays for a safe race. You really feel for the sacrifices people make to get to F1. 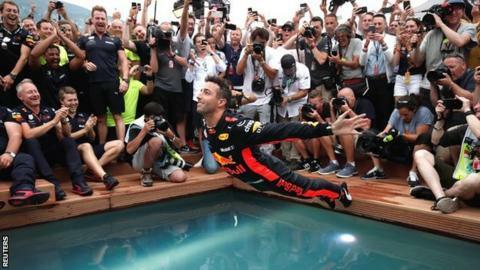 And in Ricciardo's case they have been rewarded - no more so than when we witness his victory at the Monaco Grand Prix, where he gracefully falls into the team's swimming pool in celebration. As it transpires, 2018 is seismic year for Ricciardo, who during the course of the campaign takes the decision to jump ship from Red Bull to join Renault. It's a move he takes months to ponder, and the documentary is there every step of the way.